Cytoplasm is arranged in parietal layer. It is called primordial utri^.1e. A large central vacuole is present inside the cell. Single nucleus is suspended in the center of vacuole by transverse cytoplasmic bridge. Two chloroplasts are present along the two sides of the cells. These are most prominent structures. They contain chlorophyll a, c, beta-carotene and diatomin or fucoxanthin pigment. Fucoxanthin gives the alga characteristic color. One or two pyrenoids are present in the chloroplast. But they do not synthesize starch. Their storage compound is oil or chrysolaminarin. It is the most corn non method of reproduction. It produces daughtor cells slightly different in sizes. Vegetative reproduction in diatoms ocerrs by simple cell division. The protoplast expands. It causes slight separation of cpilheca and hypotheca. Nuclear.di‘ision occurs by rthosis and cell divides into two parts. Each half receives one half of the parent cell. It synthesizes new valve. New valve is fit into the parent valve. Thus new valves are always smaller than the parent halves. Thus one generation gradually become smaller in size. It reacted to minimum size. Then its size is restored by auxospore formation. But second generation remains of same size. from common parent or different parents envelope in a common mucilaginous sheath. The nuclei of both cells divide by meiosis to form four nuclei. Three nuclei disintegrate. The fourth one -;nlarges. Its protoplast metamorphosed into gamete. The gametes are liberated from the paren frustules. They fuse to ?orm zygote. The zygote enlaiges -I) form auxospore. The auxospore secretes new valve and become adult. of mucilage. Therefore, two valves are separated from each other. It separates the inner protoplast. 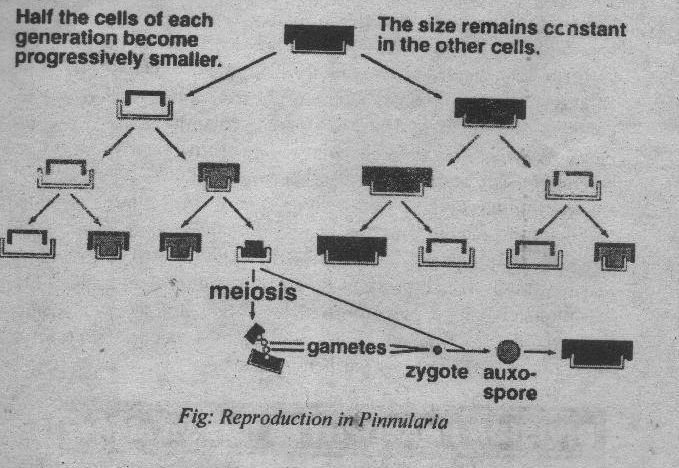 The protoplast grows to its maximum size. It secretes silica rich pectic membrane. This membrane is called prizonium. New valves are secreted inside the prizonium. Nuclear division does not occur. Therefore, auxospores are formed by parthenogenesis. 1. Occurrence: Most of the member of this division is marine. They are found in cold water. They are abundantly present in Arctic and Antarctic oceans. Many species arc grown in intertidal zone. These algae grow best 10-20 meters below the water surface. Some species are epiphytes and Lialophytes. (a) Hold fast: It is root like structure. It anchors the plant. (b) Stipes: These are stem like branches. (c) Blades: These leave like. They are present at the apex of stipe. 3. 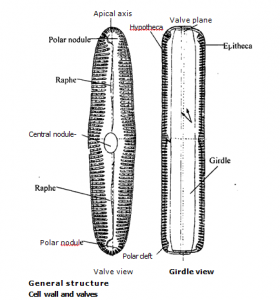 Cell wall: The cell wall has two portions. The inner portion is composed of cellulose. The outer portion is gelatinous. It is formed of algin. Algin is pectic substance of calcium salts of alginic and Iticinic acids. 4. Cell structure: The cell is uninucleate. 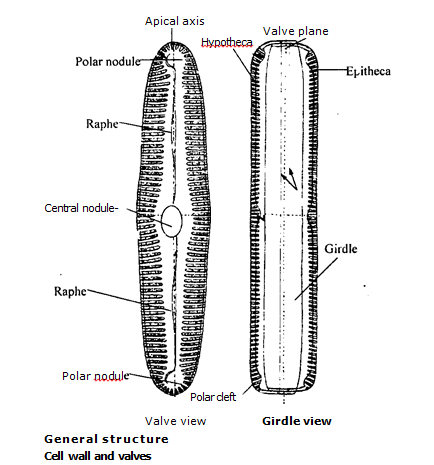 It has large vacuole. Centrosome is present in them. Therefore nuclei divide by animal like mitosis. 5. Pigments: Its photosynthetic pigments are chlorophyll a, chlorophyll b, carotcnoids and xanthophylls in the corm of fuccxanthin and diatoxanthin. Fucoxanthin is a golden brown pigment. It masks the colour of chlorophyll. Pigments are resent in chIcroplast. Pyrenoids are absent. 6. Reserve food material: Their reserve food material is in the form of dissolved sugars, alcohols, fats and complex polysaccharides. Starch is absent in them. Some other reserve protracts are laminitrin (a polysaccharide), mannitols and alcohol. Fat like colourless fucosan granule or physole compounds are also found in them. 7. Vegetative reproduction: Vegetative reproduction is common in Phaeophyta. 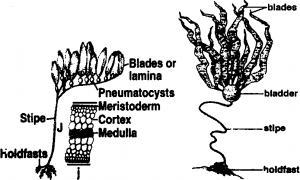 The plant body splits to form one or more part. These parts are still attached with the substratum. These parts detach one by one. They float in water and develop into new plant. In some cases, propagules are also produced. 8. Asexual reproduction: Asexual reproduction occurs by zoospores formation. Zoospores are bitlagellate. Zoospores are produced in unilocular or plurilocular sporangia. (a) Unilocular sporangia: Unilocular sporangia are produced in diploid sporophyte generation. 32, 64 or 128. Haploid zoospores are produced in each sporangium. First division is meiosis. Zoospores germinate to form gametophyte. (b) Plurilocular sporangia: These are multicellular. These are developed on haploid gametophyte plant. These are also produced on sporophytes. These sporangia produce diploid –foospores. These spores develop sporophytes. The zoospores of gametophyte also act as gametes. Sexual reproduction: Sexual reproduction may be isogamous, anisogamous, or oogamous. The gametophyte may be homothallic or hete:othallic. In case of oogamous type, single motile antherozoids are produced in gametangia or antheridia. Oogonium has single egg. In some cases, egg is discharged from oogonia. So fertilization occurs in water. But in some cases, eggs are not discharged and fertilization occurs in oogonia. Alternation of generation: Regular alternation of generation occurs in pheophytes. Diploid sporophyte generation alternates with haploid gametophyte generation. The two generations may be isomorphic or heteromorphic.